The new Honda Civic Tourer really is an impressive piece of work; designed and developed in Europe and built in Britain, the car brings a distinctive style and technology to the sector. It’s available to order from the beginning of December and will be in dealerships from February next year and offers versatility with its 624 litres of boot space and the firm’s own unique ‘Magic Seats’, which means the rear seats can be folded so the cargo area is completely flat. The Honda Civic Tourer is built in Honda’s state-of-the-art factory in Swindon and is available with two engines: the 1.8 i-VTEC petrol and the 1.6 i-DTEC diesel. Of the two, the Earth Dreams Technology 1.6 i-DTEC diesel engine is probably the best bet for most drivers since it has low running costs. It will return an impressive 74.3mpg with 99 g/km of CO2 emissions, which puts it just below the threshold for annual vehicle excise duty. The diesel engine is not only economic but also packs a punch with the Honda Civic Tourer accelerating from 0 to 60 mph in 10.1 seconds. One tank of fuel should see the car travel 817 miles and its CO2 emissions put it below the threshold for vehicle excise duty. That’s not to say that the petrol engine lacks punch to move a vehicle of this size. The 1.8 i-VTEC petrol engine is available as an automatic or manual transmission and will return 45.5 mpg on the combined cycle. New technology in the Honda Civic Tourer includes a world first in its Rear Adaptive Damper System, which adjusts the rear suspension to ensure the ride is stable no matter what the driving conditions. There’s also a slew of new innovative safety technologies including sensor based active safety systems which uses cameras and radar to deliver high levels of safety. The technology for the Honda Civic Tourer includes the firm’s city brake active system, to avoid low speed collisions; forward collision warning, to avoid crashing into the car in front, Lane departure warning and a traffic sign recognition system, among others. 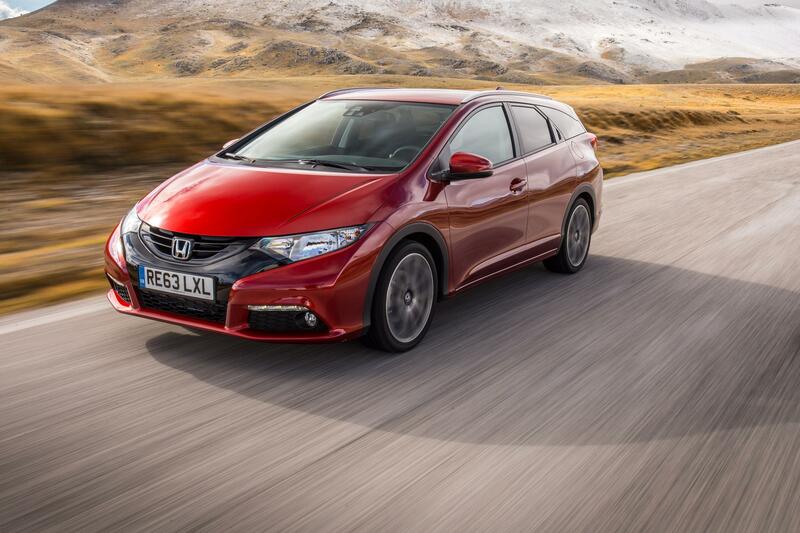 The Honda Civic Tourer range has a choice of four trim levels with the entry-level, S grade, featuring Bluetooth hands-free telephone, USB connectivity, DAB radio and 16 inch alloy wheels. As you go up the range, buyers can enjoy rear parking sensors, heated front seats and privacy glass. The top range models feature headlight washers, smart entry and start, interior blue ambient lighting and Bi-HID headlights with auto levelling. Prices for the impressive Honda Civic Tourer start at £20,265 OTR for the entry level 1.8 i-VTEC S model and rise up to £26,250 for the Civic Tourer 1.8 i-VTEC EX Plus. All of the models are incredibly spacious and just 235mm longer than the Honda Civic hatchback which will make this model range incredibly popular. This entry was posted in Car Leasing, Cars, Family Car, New Cars and tagged honda, Honda Civic, Honda Civic Tourer, lease a Honda Civic Tourer by Steve Lumley. Bookmark the permalink.